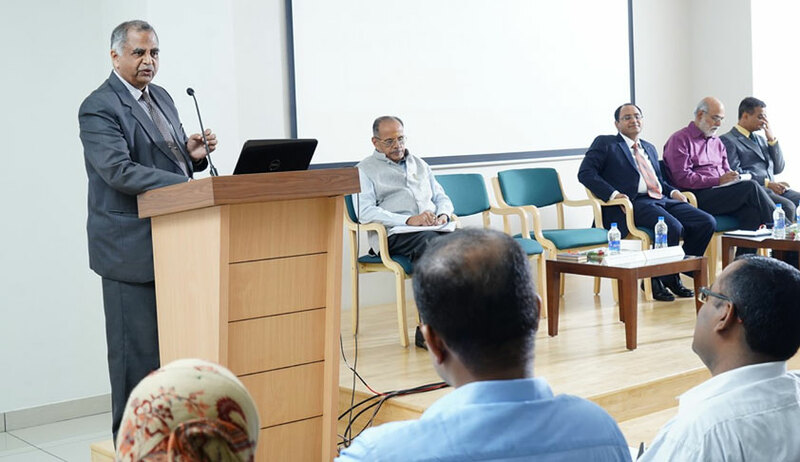 An inter-professional colloquium of lawyers and media-persons on the topic “Media, Courts and Fair Trial Guarantee” was held on March 31 at Cochin. It was organized by Bar Council of Kerala and M.K Nambiar Academy for Continuing Legal Education Program under the leadership of Dr. N.R Madhava Menon, in association with the legal publication house Complete Kerala High Court Cases. The demand for regulating reporting of court proceedings has been rising from the legal fraternity on the ground that the reports are most often inaccurate, distorted and sensationalized. In criminal proceedings, it amounts to a virtual trial by media, infringing right to fair trial. However, the attempts to make such regulations are resisted by media stating that it amounts to infringing press freedom under Article 19(1)(a) of the Constitution of India. The High Court of Kerala has recently framed norms for accreditation of legal correspondents, which mandate law degree and minimum legal practice for getting accreditation. These norms were challenged before the High Court by media houses as unconstitutional and the matter is pending. Meanwhile, a Full Bench of the High Court of Kerala has reserved orders on a petition seeking framing of guidelines for reporting of court proceedings, including oral observations made by judges during argument. It was in this backdrop that the colloquium was organized. It was attended by a galaxy of speakers from both the fields of law and journalism. The inaugural session was presided over by Justice (Retd.) R. Basant, Senior Advocate, Supreme Court of India and former Judge, High Court of Kerala. He said that press, as the fourth estate, was the conscience keeper of democracy. But at the same time, he reminded in order to properly discharge its function in court reporting it press should understand the nuances of legal process and dialogue between the bar and bench. Although they have the right to report, they cannot be selective in reporting. Sashi Kumar, the founder of Asianet TV Channel and present Chairman of Media Development Foundation, stated that the primary function of the press was to be adversarial to the State. Press is not just a market product as it stands for higher values of democracy. If it fails to do that, then it cannot claim the status of a fourth estate. Justice Dama Sheshadri Naidu, judge of High Court of Kerala, delivering the keynote address, spoke about the changed nature of media in the ‘post-truth’ world, where different spins to facts are given to suit agendas. He also mentioned about the circumstances in which of courts are constrained to pass ‘super-injunctions’, ‘john doe orders’ and ‘gag orders’ to contain the spread of misinformation in social media. Adv. George Johnson, Editor of Kerala High Court Cases, delivered the vote of thanks for the inaugural session. The inaugural session was followed by a discussion session on the sub-topic ‘Constitutional and statutory framework governing media freedom in relation to court proceedings’. Manoj K. Das, the resident editor of Times of India, Kochi edition and Suhrit Parthasarathy, Advocate, High Court of Madras delivered the keynote presentations regarding the topic. Manoj Das elaborated on the basic function of the media, which was to act as a mirror to the society to reflect its untidiness. The dislike towards media and the tendency of those in power to stifle it are natural, since media blares out uncomfortable truths; but instead of feeling annoyance, society should introspect and do some cleaning up. He opposed the demand that only legally qualified persons should be court reporters. He also emphasized that external regulation will kill the media. Suhrit Parthasarathy stated that prior restraints on news publication, even in respect of court proceedings, are not constitutionally valid. According to him, publicity is the soul of justice and idea of open courts is the foundational rock of democracy. He discussed in detail the Naresh Mirajkar case and Sahara case, where judiciary had toyed with the idea of restraining court reporting. Press freedom cannot be curtailed through judge-made laws, as they do not fall within the ambit of reasonable restrictions under Article 19(2). The next session was on the topic ‘Balancing media freedom with fair trial and independence of judiciary’. Justice Muhammed Mustaque, judge of High Court of Kerala offering introductory remarks, stated that the press was discharging a public function. Therefore, press had to act with the responsibility and restraints attached to a public functionary. Sumeet Malik, Director of Eastern Book Company and Editor, Supreme Court Cases, deprecated the tendency of media to sensationalize court proceedings, citing the example of the manner in which the latest dissent of Supreme Court in the land acquisition cases was hyperbolically described as judicial rift by some media. He stated that it was improper to impute motives to judges while criticizing judgments. He also called for restraint while reporting oral observations and casual remarks from the bench, which do not form part of record. Gouridasan Nair, resident editor of The Hindu, remarked that it was wrong to depict media and judiciary as antagonistic to each other. They are both performing vital roles for sustaining a vibrant democracy. He denied that there was need for prior restraints, and wondered how the restraints are going to be effective in the age of social media and micro-blogging sites, where any individual can act as a reporter communicating to the multitude. However, he also stated that there was need for media to introspect about its wrongs and failings. Elizabeth Seshadri, Advocate, High Court of Madras, stated that judiciary and media are similar to each other in basic characteristics - both are un-elected, exist on the basis of moral authority and public confidence can afford to be not populist and will cease to function under external regulation. Both judiciary and media are in the common goal of pursuit of truth. Judiciary, generally have been lenient towards media transgressions. But when media started becoming more intrusive and pervasive in the new competitive age, judiciary started to shed its tolerance to media excesses. She also stated that it was wrong to put blame on media always on the collective failings of the judicial system. There was need to have ‘synergy’ rather than mere ‘balance’ between both the institutions. Asaf Ali, former Director General of Prosecution, High Court of Kerala, advocated need for placing more restraints on media. According to him, there were no free media in true sense of the word, and they were functioning with vested interests to further the agendas of their political masters and commercial sponsors. It was the excesses of media which prompted the very first amendment to the Constitution, which added more grounds to Article 19(2). He cited the instances of ISRO case, Arushi case etc. where lives of innocent persons got tarnished beyond repair due to reckless media coverage. Sasthamangalam Ajith, Standing Counsel for CBI, High Court of Kerala, supported the freedom of press in reporting court proceedings with care and circumspection. George Marlo Pallath, Advocate, High Court of Kerala, M.S Saji, Advocate and Columnist and Babu Joseph, professor, SH School of Communication also offered their views on the matter. The concluding session was presided over by C.P Sudhakara Prasad, Advocate General of Kerala, who emphasized the need for balance in press freedom and rights of fair trial. Chief Justice of High Court of Kerala Antony Dominic, while making the valedictory address of the Chief Guest, remarked that accreditation norms were made due to compelling necessity. He also added that press should be reporting in public interest and not all that interests the public. Summing up the conclusions of the colloquium during the concluding session, Dr. Madhava Menon said that the main points culled out from the discussions will be compiled and submitted before the High Court of Kerala for reference. Jagadisachandran Nair, Advocate, High Court of Kerala, with more than 60 years of practice, was honored in the function with Life Time Achievement Award by Kerala High Court Cases, which was presented by the Chief Justice Antony Dominic.